The article is late this year and not as complete as I would like it to be, but here it is any way. Chris Burrage visited the site of the old Orillia Speedway in April of 2008 and sent along these photos. The snow has finally melted here in Southern Ontario, the mall shows have wrapped up and practice days and racing have started. That means I'm overdue for CanadianRacer.com's annual check on the off-season news and a look ahead to the 2008 season. The late 1960's were a busy time for race fans and racers in the Peterborough / Kawartha area. There were up to six tracks operating in the region at the same time with two more just outside. Now that the snow is on the ground and it seems like a long time to the start of the 2008 season, a review of the 2007 with photos might help break the boredom. The 2008 Canadian Sprint Car Nationals was another successful event at Ohsweken Speedway. The NASCAR Winston West Series raced nine times in BC between 1971 and 1981. The CNE has started, the back-to-school sales are on and a few leaves have started to change colour. That means it's time for CanadianRacer.com's annual look at the upcoming special shows at Southern Ontario's speedways. I made my annual trip to the Niagara region for the Civic Holiday weekend. Sunday was the "All Canadian Championship" at Humberstone featuring the Ontario Dirt Late Models. Merrittville hosted the 15th annual "Trevor Wilkens Memorial" with the DIRT Big Block Modifieds. The World of Outlaws returned to Canada for the first time in 25 years with an event at Ohsweken Speedway on July 25. Jason Sides took the feature win over Donny Schatz, Jac Haudenschild, Steve Kinser and Danny Lasoski. This year's festival honoured 40 years of Formula 1 in Canada. The new Ontario Sportsman Series held its inaugral event at Mosport Speedway on June 16, 2007. A selection of photos taken by the Web Master are in this article. The 2007 racing season is upon us in parts of Canada, so it's time for CanadianRacer.com's annual review of the off-season news. Photos from the show held at the Toronto Congress Centre on April 6-8. It must be nearly race season because Performance World is here. A brief history of the legendary Toronto track. New Stock Car Racing Book: "Track Talk - Racing Memories by jalopy, hobby and Canadian Vintage Modified drivers"
Wendy Ward Roper has written a book whose title pretty much says it all. Tons of photos and observations. The Langley Speedway Historical Society held its first-ever open house at the site of the old Langley Speedway on Septembe 10, 2006. The end of the 2006 racing season is fast approaching in Southern Ontario. Most tracks have their big show to wrap up the season. The Labour Day weekend is particularly busy this year with racing fans having to make several hard choices on where to spend their time. On August 11, the Chatham Daily News ran a story about racing returning to The Ridge Raceway. The Ridge has been a ghost track since 1995. Brighton Speedway has an action-packed schedule on tap for 2006. The title says it all. The event was held on June 10 at Legendary Motor Car in Halton Hills, ON. Gordon Wilson sent in these photos of Onslow Speedway in Truro, NS. The racing season is kicking-off across the country so it's time for CanadianRacer.com's annual round-up of news from the off-season. Robert Edgar visited the site of Riverview Speedway in Trenton, ON and sent along these photos. Gerry Liscumb has sent some photos of Northern that he took in 2005. Glen Thomas visited the site of Northern Raceway in Sault Ste Marie, ON in the summer of 2005 and sent along these photos. Eugene Gervais visited the site of False Creek Speedway (Vancouver) in January and submitted these photos to CanadianRacer.com. Racing season is fast approaching - the weather is getting warmer and its time for Performance World Car Show. The USAC Indy Car series ran at Mosport and Tremblant in 1967. Stock cars have continued to evolve over the years and everything runs in a cycle. Kirk Alexander and Nick Blackburn made separate visits to the site of this Ghost Speedway in Lawrencetown, NS. Bud Bussiere sends these photos of Langley Speedway (AKA Action Raceway) in Langley, BC. He has also sent a bunch of photos of Langley in it's racing days. Brian Pratt has submitted this article which covers the history of long-gone Langford Speedway in British Columbia. Scoudouc Airfield in New Brunswick was was a left-over WWII airfield that was used for sports car racing and drag racing from 1959 to 1967. Rejean Leblanc visited the site in the summer of 2005. Our first Ghost Speedway from Prince Edward Island was found by Rich Wilkins. A review of the events and series that the Web Master saw this year. The Fall is a great season for stock car racing in Southern Ontario. Many tracks host special shows for Labour Day or to wrap up the season in September or October. Forrest Jenkins found a second Nova Scotia Ghost Track this spring - Havre Boucher Speedway. Mark Thompson sends us his second ghost track from Alberta. The original paved Brighton Speedway still sits in the parking lot of the current Brighton Speedway dirt track. A few photos from Mosport on May 15. Mark Thompson has sent in these photos of this track in Calgary. Photos of this 1/3 mile dirt ghost track, located near Shannonville, ON. Mike Topf visited the remains of Tillicum Raceway, near Vernon, BC and sent these photos. Photos and news from Brighton Speedway's Media Day. Read about the new tracks coming this year. Matt Hansford has sent these photos of Hurricane Speedway, near Sudbury ON. Photos of the oval racers from the show. A short history of the 6 hour (or so) daytime-to-darkness road race. Photos of every stock car and road racer at this year's show. If you've never seen ice racing, read this article and then check out the real thing. The first of a series of articles covering the history of NASCAR sanctioned events in Canada. This one covers the two Grand National Races held in the 1950's. The first Ghost Dragway at CanadianRacer.com is Windsor Dragway and comes to us from Barry Dunbar of Windsor. The remains of the 1/3 mile paved Wallace Speedway are in good shape and is documented here. Ron Nelson found Dayus Raceway in Windsor. The web master found Model T Speedway, Jackpot Speedway and Teviotdale Speedway. Photos of all are in this article as well as photos of Dayus in it's better days. Ron Nelson visited the remains of the 3/8 mile dirt oval, The Ridge Raceway in Ridgetown, Ontario. Ernie Pothier found the remains of this 1/4 mile paved oval located near Bathurst, NB. Bill Brack interview by John R. Wright. Ernie Pothier strikes again! Here is the 4th track that Ernie visited and the third article from his photos. 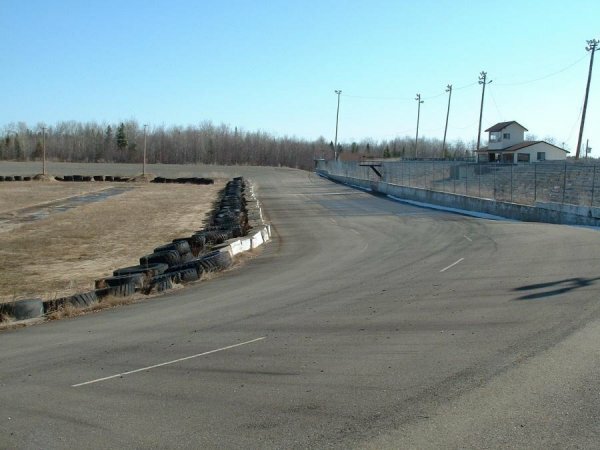 Cedar Mills is located near St. Stephan, New Brunswick and was a 1/4 mile paved oval. John R. Wright has contributed this article on long-time road racer Al Pease. The second in a series of Ghost Speedways sent to CanadianRacer.com by Ernie Pothier. Petty Raceway is located in River Glade, New Brunswick and last saw action in 2000. The first in a series of Ghost Speedways sent to CanadianRacer.com by Ernie Pothier. Hammond River Speedway and Brookside Speedway are both located in New Brunswick. An article by Dave Truemner covers the period from 1955 to 1960 when Ottawa's Lansdowne Park was the site of Wednesday night stock car racing. A quick look at how club racing has changed over the years. Get a preview of some 2004 Southern Ontario stock cars. A brief history of Ontario's legendary Pinecrest Speedway. Moosehead Premium Dry Speedway (formerly known as Exhibition Park Motor Speedway) just outside Halifax, Nova Scotia operated until 2001. At that time it joined the ranks of the Ghost Speedways. Stopping for lunch on the way to the track costs a bit more these days. Stock car racing returned to Exhibition Stadium in 1990 for the first time in 24 years. Unfortunately, it only lasted one season. Harewood Acres, near Jarvis, Ontario was an airfield circuit that hosted many Regional, National and International events from 1956 until in closed in 1970. "How Times Have Changed" will be a series of short articles that will focus on a particular aspect of racing and the changes that have occured over the years. Part 1 deals with pay outs in oval track racing. In this case, how they haven't changed much. Race tracks have come and gone in Canada over the years. Many of the old tracks were redeveloped into housing developments or shopping malls. Some simply closed and were left to decay over time into what I call "Ghost Speedways". Several of these tracks are documented by CanadianRacer.com. In 1969 & 1970 the Canadian Road Racing Championship was contested by the big, powerful Formula A cars. It would be the first time that the Canadian Championship paid a cash purse. The on-again and off-again saga of the 2004 Canadian GP continues. No Grand Prix in Canada? "Ridiculous!" you say. "Unheard of!" you say. Ridiculous, yes; unheard of? Nope; it's happened twice before.